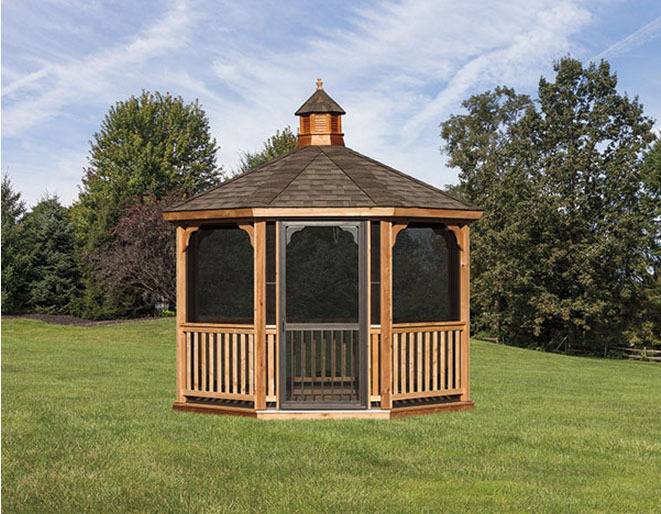 The Bel-Air Gazebo is available in octagon sizes 10'-20' feet only. Built from #1 western red cedar, this one of a kind structure offers a custom four piece post. Our Bel-Air gazebos come standard with solid anchor brackets to attach to any deck or patio. They are engineered to withstand 60 lbs. of snow load and 150 mph wind speeds. The rafters are made of double 2x4 southern yellow pine to carry the heavier snow loads and keep from warping. The beautiful southern pine 1x6 ceiling boards add additional durability and charm.